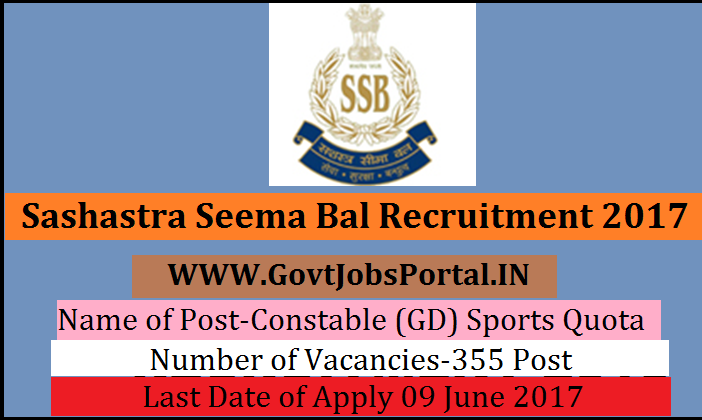 Sashastra Seema Bal is going to recruit fresher candidates in India for Constable (GD) Sports Quota Posts. So, those candidates who are willing to work with this organization they May apply for this post. Last Date of Apply 09-June-2017. Total numbers of vacancies are 355 Posts. Only those candidates are eligible who have passed Matriculation or its equivalent from a recognized board and Players who have participated in any International Sports events as a member of the Indian Squad for last 01 (One) year and players who have won medal(s) in any National Games/ Championships recognized by Indian Olympic Association, Sports Federation of (concerned sport) for last 01 (One) year. Indian citizen having age in between 18 to 23 years can apply for this Sashastra Seema Bal Recruitment 2017. Those who are interested in these Sashastra Seema Bal jobs in India and meet with the whole eligibility criteria related to these Sashastra Seema Bal job below in the same post. Read the whole article carefully before applying. Educational Criteria: Only those candidates are eligible who have passed Matriculation or its equivalent from a recognized board and Players who have participated in any International Sports events as a member of the Indian Squad for last 01 (One) year and players who have won medal(s) in any National Games/ Championships recognized by Indian Olympic Association, Sports Federation of (concerned sport) for last 01 (One) year. Age Criteria: Candidates age limit should to be possess minimum age 18 years & maximum age 23 years. What is the Process for Selection this SSB job? 1: Selection will be held on Physical Standard Test. 2: Selection will be held on documentation. What is the Application Fee for these SSB Jobs in India?